Product #21937 | SKU SHM-SCM1 | 0.0 (no ratings yet) Thanks for your rating! The SHM-SCM1 Suspension Shockmount for Large Diaphragm Condenser Microphones from Auray features a classic suspension shockmount design to eliminate vibrations from your mic stand that otherwise might reach your microphone. It is compatible with a wide range of large diaphragm condenser microphones with a threaded post and has a locking knob for precise angle adjustment. 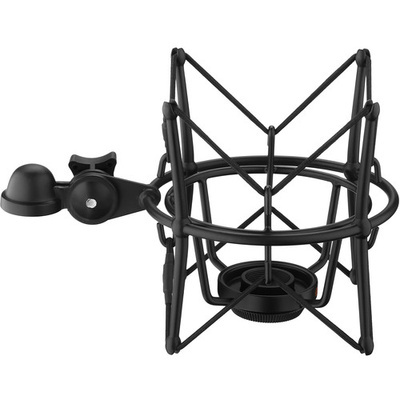 Its all-metal construction lends to its durability while its heavy-duty elastic bands suspend the mic in the shockmount's centre for isolation. A 3/8" adapter is included.